Time is speeding up, isn’t it? Everyone else got the memo but mine must have gone straight to spam because I was completely unprepared for the last fortnight to disappear without notice. What even happened? What did I do? All I can really remember is the last weekend because on Saturday, my band finally held the dinner dance for which we’ve spent half a year rehearsing and on Sunday, the Chef and I went on a little adventure for the first time in ages. Our destination: Garfield, which is somewhat of an improvement on its original name of Cannibal Creek. Even though I would happily head to a small town in the country for no reason whatsoever, this time I had a purpose and it came in the form of the Garfield Heritage Winterfest Antiques Market. Oh, and an op shop in town that was opening on the Sunday, too. I hadn’t even heard of Enid Gilchrist until the last month or so but ever since I started learning about her, I’ve wanted to get my hands on some of her books. They’ll cost you around ten or twelve dollars on eBay or Etsy, so I was rather excited when the lady running the stall told me all the ‘magazines’ were one dollar each. 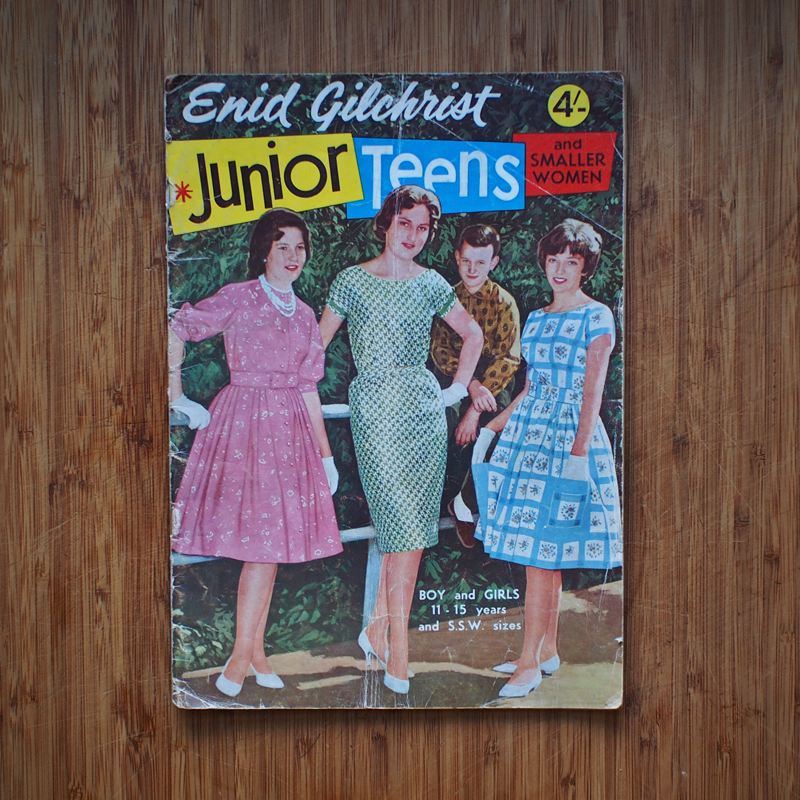 Unfortunately, all of the others were for children’s clothes, which seem to constitute around ninety-five percent of Enid’s publications, so I only ended up with this one but I was rather happy with it nonetheless. My favourite part of that cover is the creepy-looking boy in the background. I can just imagine one of the girls whispering through her smile: “Margaret, can’t you tell your brother to get off the fence and stop looking at us? I swear I can feel his eyes through the back of my head.” The poor kid probably got roped in because someone finally noticed the book was meant to be for boys as well and he just happened to be nearby. The black and white Simplicity pencil skirt is probably one of the oldest patterns I’ve found so far. Every home needs a copy of the Australian Women’s Weekly Original Cookbook. The ‘GULF’ cook book is a fantastic compilation of recipes by local ladies and includes a recipe for a snack known only as ‘munchies’. Just what every brother and sister want: matching jumpers with horses’ heads on them. I have a feeling this book might show up on a Take Me Back Tuesday eventually. We also found a book entitled Cooking with Eggs for my sister-in-law, who is currently in the process of accumulating every cookbook ever. Oh, and we picked up a couple of lemons for good measure. You picked up a couple of gems! I really want to get my hands on one of the enid gilchrist books! It was a rather successful adventure, all told. I was so excited to find an Enid Gilchrist book at such a bargain price! Good things might come to those who wait, but they certainly come to those who hunt for them in unexpected places. Good luck with your own hunt – hopefully you’ll find something soon. Yes, please do some more from the book in the last picture. I was eerily drawn to its cover for some reason… Maybe it’s because they look like a pair of really, really awful superheroes. Haha! The whole book is like that – just packed full of dynamic duos in hand-knitted jumpers. Very cool! Again you are lucky!